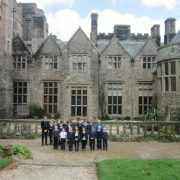 This week Flete House welcomed the key Stage 2 children from Holbeton Primary school, who are currently studying the Tudor period in history. 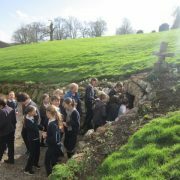 Finding a place nearby for the children to see some Tudor artifacts was proving difficult, until Anne Mildmay-White, who is a school governor, proposed a trip to Flete House as a possible solution. Flete, which is not open to the public, is only a 15 minute drive away from Holbeton, so the whole outing was achieved in under 2 hours. The oldest visible part of Flete is the Elizabethan entrance, which is closed in to form part of the billiard room, and the private chapel which is now an apartment. The children were rather more interested in the old water well, now designated a wishing well! 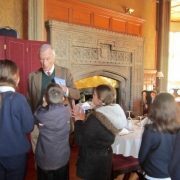 Inside Flete, Anthony Mildmay-White showed the children a portrait of Sir Thomas Mildmay, who was an auditor to the Court of Augmentations established by Henry VIII to administer the properties and land confiscated during the dissolution of the monasteries. They also saw a portrait of his son, Sir Walter Mildmay, who was Chancellor of the Exchequer to Queen Elizabeth I, and a favourite at court. She gave him an emerald and diamond ring, engraved with her name, which Anne Mildmay-White showed them, nestled in a velvet box, prompting great excitement and a volley of questions. However, probably the most memorable picture for the children was that of Henry Mildmay, painted dead in his bed, with the bedsheets cut away to show his hands and feet. He was one of the noble who sat on the council that condemned Charles I to death. These men were later sentenced to be hung drawn and quartered, but Mildmay fled to Antwerp, avoided actually signing the death warrant, and decreed that he should be painted after his death to show he had not suffered the same fate, and therefore was not attained as a regicide. Although Charles I was a Stuart king, and therefore not strictly speaking relevant to the Tudors, the creepy painting certainly rounded off a most successful visit to Flete.